A big thanks to Paul Davis for finding your way to my site and nominating me. I really appreciate the support. 1) Thank the person who nominated you and include a link back to their site. 2) Post 11 things about yourself. 3) Answer the 11 questions posed by the person who nominated you. 4) Pay it forward -- Choose 11 blogs, with less than 200 followers, to nominate and send them a comment to let them know they've been nominated. No tag backs. 5) Come up with 11 questions for your nominees to answer. Why 11? I have no idea, but I love that it's not a round number. 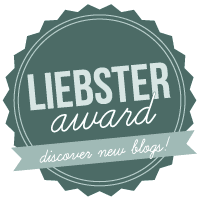 Finally, you can put the Liebster crest, or one of the other pics out there, on your page. 1) I am Sci Fi geek. My favorites include: Star Trek - all the movies (favorite: First Contact), every series (favorite: Voyager, need alcohol to watch the original series); Stargate SG1; Doctor Who; Torchwood (loved series 1-3, not so much series 4); Eureka (sad to see it go); Warehouse 13; Firefly (Not fair! Fans, you know what I mean--loving Castle though. Way to go, Nathan). In my younger days I watched Sliders, The Outer Limits, and many others. Yes, more television than books. Though always a reader and sci fi lover, those interests didn't really merge until later in life. Of course I've since read Asimov, Alistair Reynolds, etc, etc. 2) I also read about actual science. Or at least the various theories and hypotheses out there. Big Bang vs Cyclic Universe vs Plasma Cosmology. I find things like quantum physics equal parts cool and confusing. The more I read the more I realize how fuzzy the line is between Science and Fiction--the beauty of writing fiction is that I can blur the line as much as I want to. 3) I'm not big into poetry but I love Robert Service. Not entirely sure why his work stands out to me, maybe just because I remember having an illustrated version of The Cremation of Sam McGee when I was a kid. 4) My favorite children's book is The Secret World of Og by Pierre Berton. I also love Dr. Seuss. 5) Above Star Trek reference aside, when I think of William Shatner I think 'host of Rescue 911' (another childhood favorite) before 'Captain Kirk'. 6) I love music. I play tenor sax, guitar, and piano. I'm no superstar at any of them, but they enrich my life and I'm thankful that my parents put me in piano lessons way back when (even though the lessons themselves didn't last :P ). 7) I tend towards individual sports over team sports. Mostly swimming, skiing, and running. I like being active, but I'm not really competitive--well not in sport. Arguments are another matter. 8) I love rain and snow, but hate driving in them. 9) I like to see the humour in things as much as possible (I'll admit I'm not always successful). I think humour opens up subjects we may otherwise avoid. And no subject should be avoided. Plus, life is just more fun when you're laughing. Many people criticize sarcasm for various reasons, but I think it is a wonderful tool and use it often. Being direct is good too, just not as much fun. 10) I like people, but crowds exhaust me. 11) Nothing is more relaxing for me than a hot bath. Especially with a glass of wine within reach. 1) If you could be a supernatural creature, which would you be? No specific creature comes to mind, but I've always wanted to be telekinetic. Breathing underwater would be cool too. 2) What weapon would you use if you were in a combat oriented novel? Guns, swords, maces, all are welcome. I'd be all about martial arts/unarmed combat, but might consider adding swords to the mix. 3) What is your favorite genre and why? Pretty much anything that falls under the sci fi umbrella. Less so pure Fantasy. 4) What genre can you not stand and why? Can't say there's any genre that I can't stand, but I currently avoid anything with a vampire on the cover. I liked vampire stories when I was younger, so this aversion may pass as the fad dies down. 5) What do you put on a burger? We’re getting close to lunch…. Mmmm...I will never be a vegetarian. At least not by choice. Usually cheese, ketchup, mustard, onion, and pickles. 6) If you had to pick wealth, fame, or love (from a lover, we’ll say you have a very loving family), which one and why? Love. I like shopping, but don't love it, so wealth beyond a decent living would be lost on me (not that I'd turn it down mind you). Fame would lead to more of the aforementioned crowds that exhaust me. Though it would be nice for enough people to know about me that I could make that decent living as an author--I'd be willing to put up with a few crowds to that end. 7) Who is the most influential writer to you and why? Steven Moffat, along with other writers I've seen interviewed on Doctor Who Confidential (yes I'm that much of a geek). While watching this behind-the-scenes show I got my first real glimpse at the genesis of a good story (I never studied creative writing in school). The writers talked about where their ideas came from and how a plot evolved, sometimes in a completely different way from what they originally imagined, etc. I realized the way their imaginations worked wasn't so different from mine. For some reason this was my light-bulb moment: wait a minute, I could do that. I single out Steven Moffat because I quickly realized that all of my favorite episodes of Doctor Who had been written by him. Then I went on to watch other creations of his (Jekyll, and Sherlock--which reminds me: Mark Gatiss, also awesome) and loved those too. And, no one can craft a good villain like Steven Moffat. 8) You get locked in a friend’s bathroom and have to wait for a locksmith to get you out. You have an hour. What do you do? Take five minutes to snoop through the medicine cabinet, then lose myself in my own head--hopefully coming up with a good story to write down later. 9) What music do you listen to while writing? Why does that music inspire you? I don't listen to music while writing. I'll end up focusing on the music instead of the writing. I do sometimes listen to a recording of rain sounds, especially if there is other noise in the house that I want to block out. 10) Who is the most supportive person in your life for your writing pursuits? 11) What is one word you write over and over again, and every time it sets off spell check? Colour, Humour, Neighbour, and any other word that the 'US English' spell check thinks should end in 'or' instead of 'our'. I tenaciously stick to the 'our' ending anyway because I like the look of it better. 1) What prompted you to start your blog? 2) What was your favorite subject in school? 3) How do you start your day? 6) Who stands out as someone —teacher/mentor/parent/friend/etc—who had a particularly positive influence on you when you were young? 7) Name something that makes you feel good just by thinking about it. 8) What do you do to relax/unwind? 9) What is your drink of choice? (Whether alcoholic or non). 10) Name three favorite items in your home. Anything, big or small. 11) Name a character—from a book, movie, tv show, wherever—who you strongly identified with. And that's it. I can't wait to see how everyone answers. Have fun!